Here at Lazerbuilt, we offer various portable Power Banks and Cables to suit the needs of your customers. With Smartphone’s and Tablets getting discharged at a higher rate, consumers are demanding a portable source of Power. The Power Bank market is estimated to grow at a CAGR ~23% between 2015 and 2020 because of increased demand. Power currently makes up to 40% of the accessories market. This makes is an essential for your accessory range. 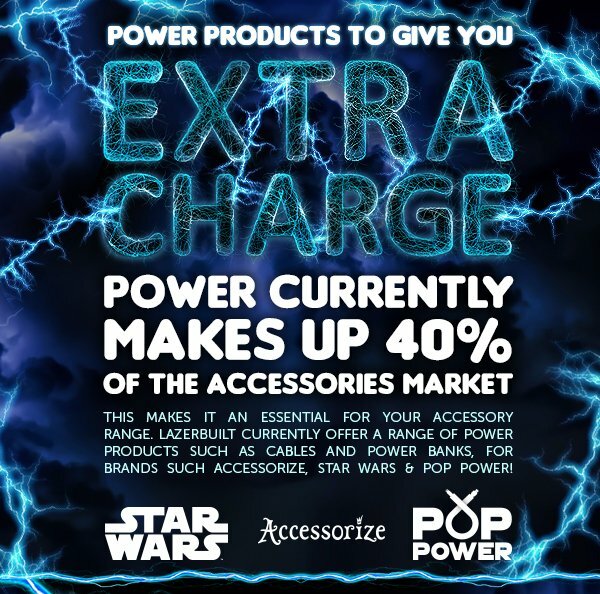 Lazerbuilt currently offer a range of Power products such as Cables and Power Banks for our Accessorize, Star Wars and Pop Power brand. Due to high demand, we currently have our flat Accessorize Power Banks available, which are perfect for a female target audience, with their fashionable floral and stylish patterns. Our popular Kawaii Mini Model Power Banks have been very popular, with current designs including Marvel’s Spiderman, Captain America and Iron Man. These will be available again from January. In 2017, Lazerbuilt are planning to manufacture more Power Banks due to high demand. A Range of tube and flat Power Banks will be available for our ever-popular Star War’s and Marvel brands. Tube Power Banks will have a Power capacity of 2600mAh and the Flat ones will have 4000mAh. Additionally, we have two different designs of Star Wars Car Chargers available to order; designs include R2-D2 design or Darth Vader. With two charging ports and a light-up feature when charging these will be a hot gift for Christmas! All of our Power Cables are 1M in length and are available in both Micro-USB and Apple Lighting MFI. Micro-USB Cables are suitable for most android devices including Samsung and HTC Smart phones and our MFI lightning Cables are Apple Certified. Our Power cables feature a range of stylish patterns and styles, making these products suitable for both male and female target audiences, meaning there is a cable for every customer! For more information on our Power accessories get in touch here!